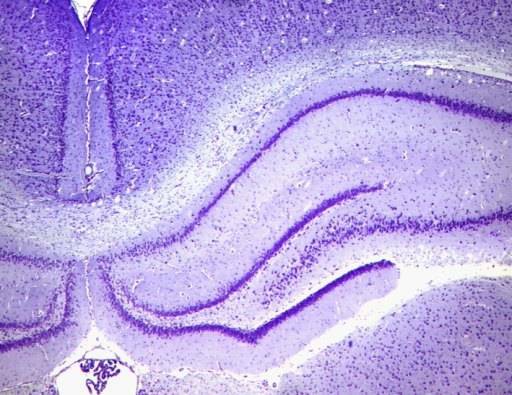 The hippocampal formation is a bilateral structure sandwiched between the cerebral cortex and the thalamus. Figure 1 depicts a reconstruction of the hippocampus (yellow) in its three-dimensional (3D) position within the rat's brain. These 3D reconstructions were made from the serial sections of LONI's Rat Brain Atlas. A section through the middle of the brain (Figure 2) shows the hippocampal formation in cross-section. 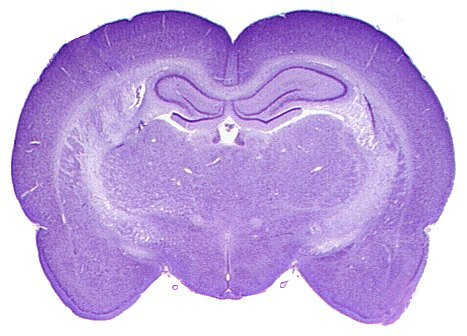 Staining a brain section with cresyl violet reveals more structure (Figure 3). The Nissl substance (rough endoplasmic reticulum) is darkly-stained by cresyl violet, hence the term Nissl stain. In Nissl-stained sections the cell bodies of neurons, which contain a lot of rough endoplasmic reticulum, appear as dark granules at low magnification. The pattern of granular and molecular layers within the hippocampal formation is clearer at higher magnification (Figure 4). Dendrites extending from the dark cell bodies fill the light violet regions, the neuropil, where they make numerous synaptic connections with axons.